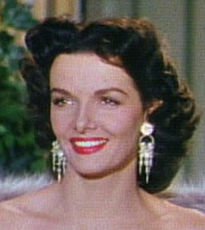 American bombshell actress, Jane Russell, has died from respiratory difficulties. She is best known for her film work from the 1940's & 1950's, including "The Outlaw" and "Gentlemen Prefer Blondes." She also sang with the Kay Kyser Orchestra and was hailed for her singing and comedic talent. She also performed humanitarian works by campaigning for adoption and adopted children. Her public funeral was held March 12 at Pacific Christian Church in Santa Maria, CA.